It was a dream years in the making. Several years of planning, hoping, waiting . . . a move across the country . . . months spent studying and training, followed by another four months as an intern . . . when finally, all the hard work and dedication paid off for Leah. She got the job and was living the dream with a bright future ahead of her. Less than a month later, it all came crashing down overnight. A medical exam to check out a persistent, painful condition revealed a severe allergy that makes it impossible for Leah to keep a job in her field. She hasn’t even finished paying off school, and she’s already forced to look for a new line of work. Leah described her experience to me as “rather crushing.” I can only imagine what it must feel like to invest all that time, energy, and money into something only to have it taken away from you in a moment. I know you’ve been there. Life in a broken world is full of unexpected and tragic experiences. But even though we know not to be surprised at fiery trials, we still wrestle with what to do with them. 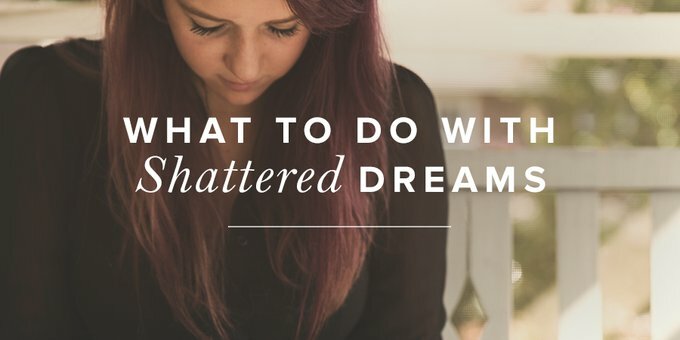 How do you handle shattered dreams? How do you find hope when you’ve been bitterly disappointed? How do you endure watching a loved one suffer? This feeling of disillusionment or abandonment is a common theme throughout the Bible, particularly in the Psalms. Psalm 89 was likely penned during a time when the nation of Israel was defeated and captured by their enemies. The Israelites, including the writer of this psalm, Ethan the Ezrahite, were exiles in a pagan, foreign land, far from the comforts of home. In this context, Ethan asks despairingly of the Lord, “How long, O LORD? Will you hide yourself forever? . . . Lord, where is your steadfast love of old?” (vv. 46, 49). I really appreciate the raw, vulnerable passages in the Bible like this one. It affirms that I can be honest and humble in my prayers. But it also brings comfort knowing that when I feel discouraged or disheartened like the psalmist, it doesn’t mean I’ve gone off the deep end or turned heretical. It just means I need to be reminded of God’s Truth—that He still rules and reigns, He’s still near, and He hears my cries. I will sing of the steadfast love of the LORD, forever; with my mouth I will make known your faithfulness to all generations (v. 1). For who in the skies can be compared to the LORD? Who among the heavenly beings is like the LORD? (v. 6). Blessed be the LORD forever! (v. 52). This past Thanksgiving, God gifted me with a taste of His steadfast love for me. I ran a 5K for the first time in my life. Yes, the entire 3.1 miles! Now I’m not a runner and never have been, so I never imagined myself voluntarily training for a race. Especially not after battling a debilitating disease for the last two-and-a-half years. This time a year ago, I was hardly able to get out of bed or even take a shower due to pain and fatigue, and yet there I was, running for thirty-six minutes straight! It was a small miracle. Jogging across the finish line, I was completely overwhelmed with gratitude for God’s faithfulness and sustaining grace. We don’t always like or understand the path God has for us. There are still days I wake up without much energy or am kept awake at night due to physical pain. My friend Leah is still looking for a new job. The troubles you’re experiencing today are also undoubtedly unwelcomed. The answer is not to “put on a happy face.” It’s to acknowledge and cling to God’s goodness even as we acknowledge our painful situation. I don’t know what you’re going through or what disappointment you or a loved one are facing, but one day you’ll run your race. I have full confidence of this because I have full confidence in the loving, unchanging character of our God. God does answer prayer (Jer. 33:3). He does do all things well. He is faithful and kind, generously giving more than we can imagine or comprehend (Eph. 3:20–21). God is good and He is for you (Rom. 8:31–33). We know these things to be true, but sometimes we need a gentle reminder. Whether we’re reeling from the pain of loss or abandonment, waiting for a major breakthrough, or dealing with any kind of disappointment, we don’t have to despair. Together, let’s continue to wait on God and trust in His character, cling to God’s Word, and look to Jesus as living proof of His steadfast love. In Him alone is where we will find hope.